Very exciting afternoon here! We recently replaced a portion of our lawn with desert plants to conserve water and had the exterior of the house painted. 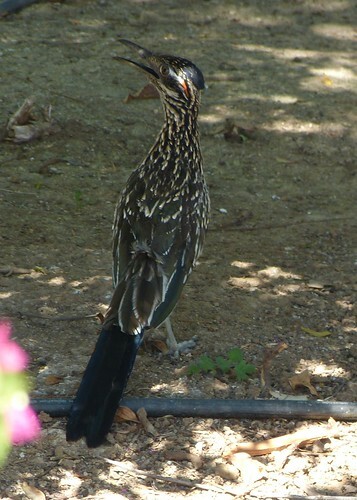 Chris was outside this afternoon finishing up with the painters when out from the driveway shrubs came a roadrunner! It ran across the driveway and onto some of the new boulders under the new tree. 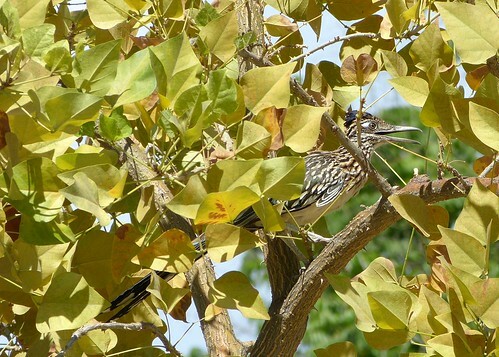 It then went up our coral tree and caught a lizard - this makes Chris very happy! Chris had the painters keep an eye on it while she ran for a camera. Mike had the birding camera with him today so the backup camera was used for these photos. It came down from the tree and ran back around the new desert landscaping before going down the slope and checking for things to eat in some of the older shrubs and then Chris lost track of it. We are wondering how long it has been around and perhaps we did not see it because it was always under thick shrubs. Now we are happy to have it visiting and enjoying our new landscaping and hopefully Mike will get to see it in person also.